Here is a First Tier Tribunal decision on a bedroom tax appeal that overturns the landlord’s assertions on bedroom numbers. It is a Scottish case, but nothing turns on that. I’m grateful to Joe Halewood for bringing this to light (though we differ on its significance). While the decision is very much on the unusual facts of the property in which the Appellant lives, there are some interesting points of potentially broader application. The decision accepts that it is reasonable for the benefit authority to rely on the landlord’s description of the property. But, significantly, the landlord’s description is not determinative. The FTT is (at least this Tribunal is) quite happy to take on the task of determining whether a ‘bedroom’ as described by the landlord actually is a bedroom, and to replace the landlord’s description of the property with its own. In this instance, from 3 bedrooms to one. Historic use of the room is considered in terms of whether the room ever was, or could reasonably be used as a bedroom. The physical properties of the ‘bedroom’ are also considered, including size, useable floor space, ceiling height, light etc.. While this is only an FTT decision, and not binding at all, the approach does raise the interesting prospect of, for example, those with adapted properties where a bedroom has been physically changed in purpose, or those with small box rooms, making successful appeals which overturn the landlord’s own designation of bedrooms. It also suggests that the issue of ‘what is a bedroom’ might well be preoccupying both the FTTs and the Upper Tribunal for some time to come. That’s what I’ve always expected a Tribunal to do. The landlord’s description would only ever be a starting point, the decision would be down to the actual facts of the case. Lord Freud’s assertion that it’s up to the landlord when there’s absolutely nothing in the legislation to say that just demonstrates how little he knows about the law. Ministerial statements alone carry very little weight in decision making. The big issue is what will happen when somebody lodges a HB appeal on another matter but the Tribunal decides to also look at the number of bedrooms even though it wasn’t an issue raised by the appellant. A number of local authorities are ‘reclassifying’ properties to protect their HB income. What if an appellant appeals against, say, a capital assessment but the Tribunal ends up deciding that what their landlord describes as a 1 bed flat is actually a 2 bed? The Tribunal would have no business wandering off on a frolic of its own. If the appeal has nothing to do with bedrooms, raised by neither party, the Tribunal should not consider the issue. Moreover, as the decision on bedrooms can only be made on the facts, as in this case, if neither party has turned up with any material or evidence on rooms, the Tribunal has nothing to make its decision on. It has the powers to do so though. It’s analogous to someone appealing against their Care Component of their DLA and the Tribunal decides to look at the Mobility Component too. My knowledge is rusty but as far as I remember caselaw has approved of such an approach as long as fair warning is given, opportunity to adjourn etc, especially when doubts might be obvious. I reckon a Tribunal would be on pretty safe ground, legally if not morally, looking at the question of the number of bedrooms if there is clear evidence there are two when the landlord has ‘reclassified’ the property as 1 bed to avoid the bedroom tax. After all, if such evidence is before the Tribunal it’s likely to be pretty conclusive one way or the other. Bearing in mind a Tribunal’s inquisitorial duties the question might be why did they NOT look at it, rather than why would they. I think it’s a possibility advisers should consider in appeals involving reclassified properties. Yes, a fair point. It may also depend if there was a rent reduction. Most of the reclassifications I have seen have been of (very) small rooms, in any event. I don’t think we disagree on the legal issues and the weight that is given to them or not as the case may be. The judgment here may have not so great legal power in isolation but is incredibly significant in practical terms. Tenants will see this case and will feel empowered to start and appeal or bolster their existing one. Landlords – Can social landlords wait and allow subsequent tribunals which rule properties are 1 bed not 3 beds and hammer down their asset values causing severe financial problems with their lenders? No of course they cant. 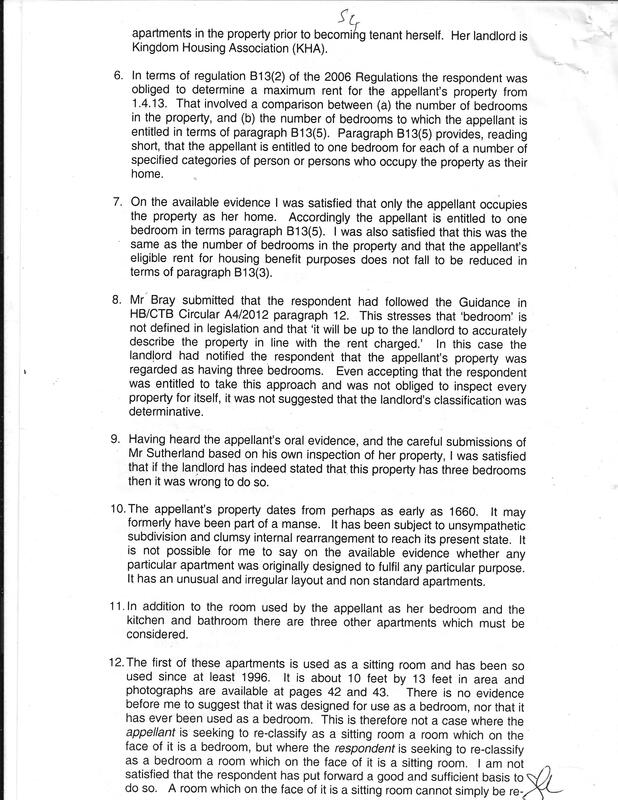 Councils – this judgment in the reported opening remarks says the council didnt even bother to inspect. It then goes on to pay plenty of regard to the pictures of size and argument around that which says strongly that in a disputed case the councils really must go out and inspect. The cost pressures that will have for councils is significant. An added point here is that Bristol City Council sent out surveyors to measure up rooms of under 50 square feet – costly enough in itself and for one issue only. Now councils will have to go and inspect for room size, usable floor space and room usage and a number of issues. Factor in the additional time and resources needed and this becomes a huge cost. There are many more subtle issues in this judgment too – what is “appropriate” in paragraph 14 or “reasonable fit for use” in para 15? We can speculate yet they open up two separate and new channels of appeal in isolation and in conjunction with other legitimate grounds such as size or purpose. I don’t think it suggests there is any responsibility for Benefit authorities to go and inspect, even in cases of dispute. I looked carefully for such a suggestion and it isn’t there. You and I might think that would be a good idea, but then the Authority has nothing to go on in terms of what would be a bedroom. No criteria at all. And this case doesn’t offer much in the way of transferable criteria either. The interesting thing here – and I agree with you – is that it opens up the FTT and UT developing a working definition of ‘bedroom’, albeit piecemeal, on the facts of each case. I have to disagree. When a dispute is raised the councils cant say go dispute with your landlord as they have done consistently as the landlord word not determinative. It is a decision for the council so how do they decide? If they wish to decide at review than they must visit, as they are unlikely to merely accept the tenants word. If they wish to decide at appeal (ie be bloodyminded) then they risk the same opening remarks reported here – the council didnt even go out and inspect! 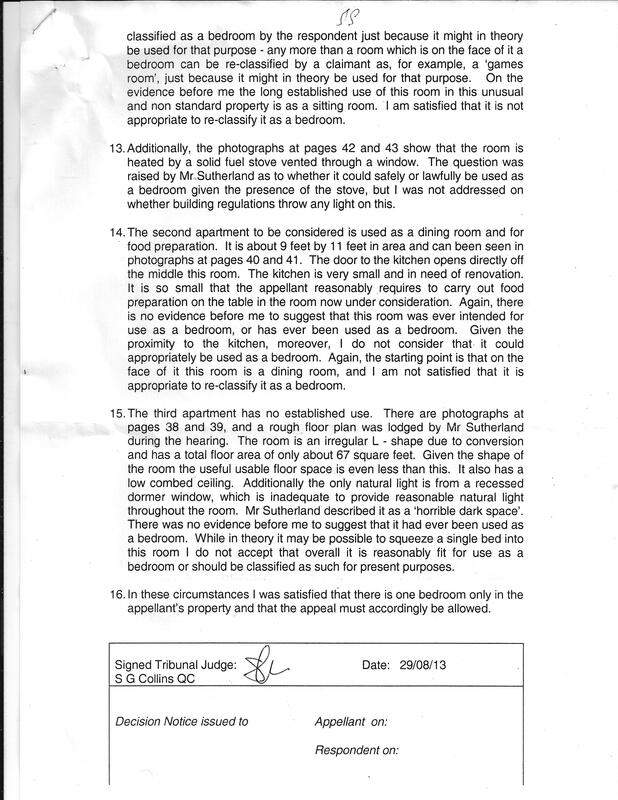 But if the Council (as Benefit Authority) do inspect, what criteria have they got to decide if a room is a bedroom? None. None at all. Unless and until some criteria emerge from FTT and UT case law (or the County Courts in defending possession proceedings) the Council has no basis to make a decision against the landlord’s reports. The opening remarks are neither here nor there. I doubt that any Council would be particularly embarrassed by them. Normally, when something is not defined in legislation the first port of call is the ordinary English usage of the word. As I implied above, in most cases a bedroom is a bedroom is a bedroom. So the Council will inspect and say “Yep, that’s a bedroom alright”. Most of us if we’re honest, faced with somebody trying to convince us that their 2 bedroom house was in fact only a 1 bedroom, would assume that that person has issues. Having said that I do think there is a robust case for arguing <50 sq ft rooms are not 'bedrooms' due to them being ignored as such in other legislation. Robust, not necessarily watertight imho. Will be interesting to see how such cases are dealt with by the UT. Where it starts getting messy is the fact that in many cases local authorities are landlords as well as benefits authorities. As landlords they have little interest in a sizable portion of their tenants suddenly being unable to afford their rent, hence some are reclassifying swathes of properties on rather spurious grounds. Nottingham, eg has simply decided that, as it doesn't rent its high rise properties to families, for benefits purposes all these properties are now classed as 1 bed, regardless of how many bedrooms they actually have. The spare rooms are being referred to as 'studies'. Lovely idea for those tenants affected but legally quite potty. But what happens to those who don't benefit, eg tenants in low-rise or Housing Assoc tenants? Aren't they entitled to feel a little short-changed? What if an HA tenant from Nottingham facing the bedroom tax decides to appeal on the basis that THEIR spare bedroom is in fact a study too? How could a tribunal justify refusing such an appeal in the full knowledge that the Council decision-maker is happily waving through hundreds of other 2 bed properties as 1 beds? When they themselves have 'looked the other way' when an HB appeal on income/capital issues involving a 'reclassified' property had previously been before them? It may be legally defensible on the case in isolation but is it really in the interests of justice? I predict a dog's breakfast. Oh no argument on the dog’s breakfast. Leaving ‘bedroom’ undefined made it inevitable. There is sufficient law on less than 50 sq ft for that to have persuasive effect, I think – and have argued before – but as it is not binding, it will be for a UT, or High Court or above to settle. On the rest, yes, it is troublesome. Freud has indicated that frankly the DWP don’t care how many bedrooms a landlord says the property has, so long as that is reflected in rent levels, but of course that has no legal basis. Just a thought. When/if Universal Credit is fully implemented, where will decision making on rental housing element be? Will it stay with local authorities or taken within DWP? You also argue no point of reference against the landlords remarks and yet they are not determinative according to the judgment. 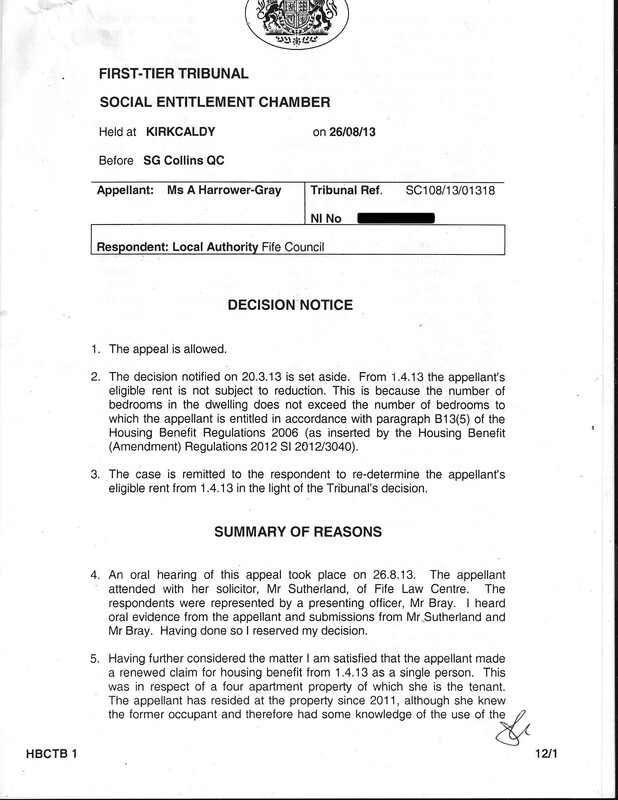 All the judge said was councils were free to choose to accept the landlords word, yet they were also free to not accept. How the landlords view has become some benchmark for councils – the decision making body -when the same A4/2012 guidance at para 20 says they do not have to provide any data whatsoever is for me a weak construct. Joe, you are asking for it to make sense. It doesn’t. The point being that the regulations don’t provide either a definition or a point of reference (apart from the landlord’s description). The benefit authority is a creature of statute. It simply can’t go round inventing its own criteria, or even deciding which criteria it is going to rely on for itself. If it did so, it would face challenges from landlords and tenants. Giles, I think you’re worrying a bit too much over a lack of a statutory definition for ‘bedroom’. After all, private sector HB has had restrictions partially based on property size for years and it has managed. Ok, I know the Rent Officer service is involved with that but if it was a problem we would have still seen challenges. Also, back to DLA analogy, a ‘cooked main meal’ isn’t defined despite it being central to the award of the low rate of the Care Component. That has been the source of countless challenges at all levels but nobody suggests that it’s a fatal flaw in the legislation. Ordinary English usage is a quite common form of legal construction. Even if ‘bedroom’ was defined it would only be a matter of time before somebody started arguing over the meaning of the words used in the definition. Like I say, a ‘bedroom’ isn’t seen by many as a particularly complex concept to get your head around. Of course there will be appeals at all levels but, as they say, s*** happens. It wouldn’t be the first time legislation has left matters to the interpretation of the courts. What I do think has caused a problem is Freud’s bone-headed statement that it was categorically up to the landlord, something that has no legal basis. His intervention has taken people’s eye off the ball and decision-makers wrongly taking that as gospel is what will cause the problems I think. The difficulty is that all previous means of deciding – including the rent officer referral – has been expressly removed. Now it may well be that the FTT and even UT will take an ‘ordinary english’ approach, but I don’t think it is open to the Benefit Authority to start making up its own definitions. And even if they could, which I doubt, the post code lottery would be abysmal. This is why the Councils are relying on what the landlord tells them. They have been authorised to do so. The comparison with the private sector is a red herring. Under LHA housing benefit only has to work out what size property they household needs and pay out accordingly, it doesn’t matter what size property they actual go on to rent. DWP unfortunately overlooked this when claiming the bedroom tax would just replicate the rules that private tenants have abided by for years. I still disagree about the landlord role and the legal weight you place on this. Councils were advised in para 12 of the guidance pre April 1 to ask Landlords for an accurate description of the ‘property’ and a property is not the same as the number of bedrooms it contains. So no obligation whatsoever on landlords pre April 2013 to offer a point of reference more of a suggested and voluntary code (so how can it be so that their view is considered a de facto point of reference) and then after this the point of reference becomes the tenants view !!?? The appellant in this case has just posted on IH that all 8 cases that day were asked whether the council had come out to inspect (they didn’t). Hence for me any weight given to this specific case of a 1660 property being the reason why it was asked appears a weak argument and then assuming that is why and the ONLY reason why as CIH and IH have done is even more discredited as a valid argument to significance. I am still of the view this means councils will have to go out to inspect disputed properties as to bedrooms in terms of size and usage and appropriateness to be deemed a ‘bedroom’ and if they do not they risk incurring the wrath of the tribunal when each case reaches it. Council’s haven’t got the resources to go and inspect every property requested of them. And as NL says, they’re not obliged or empowered to do so. RP’s, facing loss of income and possible breach of borrowing covenants, if multiple properties are reclassified `downward’ will be mightily p*ssed off if Council’s start doing that unilaterally. The nos. of properties truly misdescribed is going to be tiny, albeit that’s no comfort to each tenant affected. How can the landlord provide the seminal point of reference if the landlord was under no obligation to provide anything? Does that mean if landlords had refused to provide any data the bedroom tax decisions would not have been made? Further how does that square with the landlords view not being determinative? And yes as soon as they are anonymised to the appellants satisfaction i will forward. Where is the guidance for both Councils and tenants on how to measure the “usable floor space” in a room that the Benefits Section claims to be a bedroom? The Benefits Section is sending a property surveyor to measure my daughter’s room-under-appeal shortly. It has the bulkhead of the stairs in it, a narrow entrance where the door opens into the room, and a wall-mounted radiator. What guidance can we produce for the surveyor to enable him to measure the room correctly?